Needle Grip-It  - $7.06 : Yarn Tree, Your wholesale source for cross stitch supplies. Item 5158. Needle Grip-It . Easy needle handling is here! 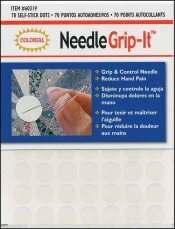 Give your fingers a little more traction with these flexible self-adhesive soft plastic dots that stick to your thumb and any fingers you use to pull or push needles. Stays securely in place, even through hand-washing. 70 dots per package.